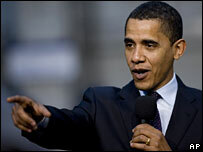 Barack Obama has beaten rival Hillary Clinton to win the Democratic primary election in the state of Mississippi. Mr Obama won 60.7% of the vote to Mrs Clinton's 37.1%, polling strongly among African-American voters. The result is not decisive but boosts his lead in terms of delegates at the August convention where the party will choose its White House candidate. With the Republicans' race settled, their presumptive nominee, John McCain has been focusing on fund-raising. Mr McCain, who is set to secure the Republican nomination at the party's national convention in September after winning the backing of a majority of delegates, is under pressure to build up a campaign war-chest ahead of November's election. Speaking to CNN from Chicago, Mr Obama welcomed the "wonderful support" of voters in Mississippi. The results followed a day of campaigning dominated by a row over the volatile issue of race, sparked by an interview with Clinton supporter Geraldine Ferraro in which she implied that Mr Obama has only been successful because of his ethnicity. Delegates needed to secure nomination: 2,025. "If Obama was a white man, he would not be in this position," said Ms Ferraro, a vice-presidential candidate for the Democrats in 1984. Mrs Clinton, senator for New York, said she regretted Ms Ferraro's comments, and did not agree with them. 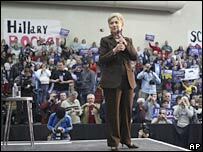 "It's regrettable that any of our supporters - on both sides, because we both have this experience - say things that kind of veer off into the personal," she told the Associated Press. "We ought to keep this on the issues." One of Mr Obama's senior advisers, David Axelrod, has called on Ms Ferraro to be removed from the Clinton campaign. In a follow-up interview with California newspaper the Daily Breeze, which originally broke the story, Ms Ferraro refused to withdraw her remarks. "Racism works in two different directions. I really think they're attacking me because I'm white," she said. Asked about the apparently worsening relations between the rival camps, Mr Obama said his campaign had been "very measured" in how it talked about Mrs Clinton. "I've been careful to say that I think Senator Clinton is a very capable person and that should she win the nomination, obviously I would support her," he said. "I'm not sure that we've been getting that same approach from the Clinton campaign." Exit polls of Mississippi voters conducted for AP painted a picture of an electorate divided along racial lines. Mr Obama won support from nine out of 10 black voters in the state, while Mrs Clinton won about three-quarters of the white vote, the exit polls suggest. Mrs Clinton did better with groups of white voters that have, in some earlier races, favoured Mr Obama. They include college-educated men, independent voters and those aged under 45. Clinton campaign spokeswoman Maggie Williams congratulated Mr Obama on his win. "Now we look forward to campaigning in Pennsylvania and around the country as this campaign continues," she said. Former President Bill Clinton planned to campaign for his wife in Pennsylvania on Wednesday, reflecting the state's importance as the next major battleground. It is due to vote on 22 April, with 158 delegates up for grabs. Under the Democratic Party's system of proportional representation, Mr Obama picked up at least 17 of the 33 delegates on offer in Mississippi. Mrs Clinton gained 11 delegates, while five more are still to be awarded. Mr Obama currently leads the fight for delegates with 1,596 to Mrs Clinton's 1,484, according to AP. The successful candidate needs 2,025 delegates to secure the Democratic nomination. Meanwhile, Mr McCain, who has raised less in election funds than either of his Democratic opponents, is touring the country as he seeks to fill his campaign coffers. The Arizona senator will visit Boston, Pennsylvania and Chicago this week.